Suggested admission is $15. More if you can, less if you can’t. “Modern Music” is so last century. Literally. The modern era in music began over 100 years ago. 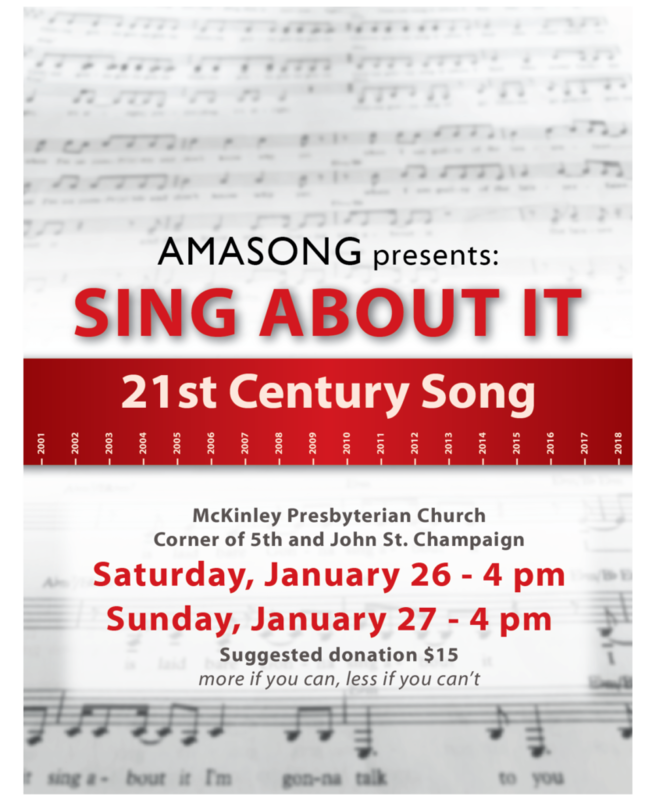 Come hear what is happening in choral music today as Amasong, moving forward, presents “Sing About It,” a concert composed entirely in the 21st century. Drawing from the entire history of musical styles and unbound by any particular school of thought, these living composers create sounds as unique as they are. Are you a woman who likes to sing? Does the word audition intimidate you just a tiny bit? 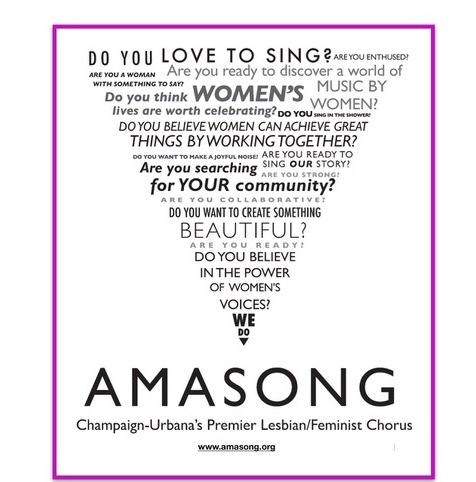 Amasong is a local community women’s chorus, beginning their 28th year of making music and making waves in central Illinois. 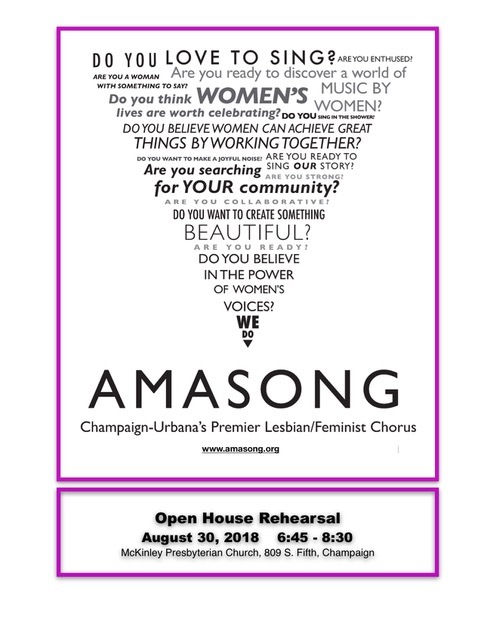 On August 30, 2018 we will host an Open House to let women see what Amasong is all about. This will be an open rehearsal with singing and no auditions. The Open House will be at 6:45 p.m. at McKinley Presbyterian Church, 809 S. Fifth St., Champaign. For more information about the chorus, visit us on Facebook or check out the rest of our website! 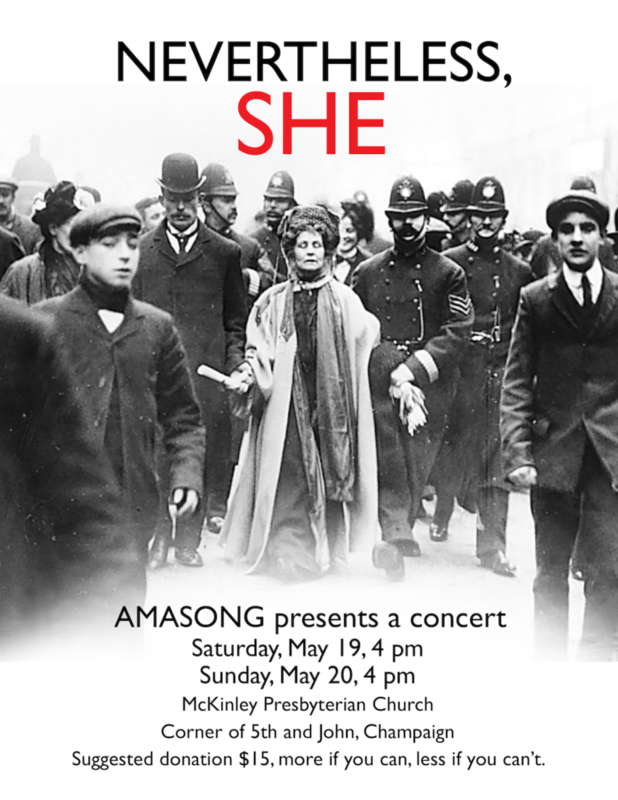 Bring a friend and come sing with Amasong! Included will be works written or arranged by Fanny Mendelssohn, Meredith Monk, Lisa Young of Coco’s Lunch, 17th Century abbess Chiara Margarita Cozzonlani, Smitha Vishveshwara, Ivette Herryman Rodriquez, Meagan Johnson, Tone Krone, Ethel Smythe, Peggy Seeger, Eleanor Daley, and contemporary artist, Imogene Heap. 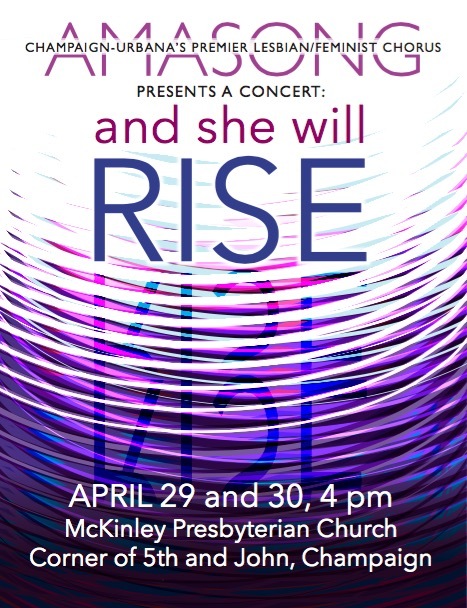 As always, the women of Amasong will sing across genres including classical, folk, avante garde, world music, and a Justice Choir favorite by Abbie Betinis. Amasong will also welcome back CU’s all women folk bluegrass group, the Coneflowers. There will be a silent auction/raffle of gifts donated by local businesses. Suggested admission is $15. More if you can, less if you can’t. On Thursday, January 18, our regular evening rehearsal will be an open house for all self-identified women who sing in the treble range who want to know more about what Amasong is all about! Now is an especially fun time to join Amasong: in June, we’re going to Grand Rapids, Michigan to participate in the Sister Singers Network choral festival (June 27-July 1, 2018)! We’ll be joining 19 other choirs with hundreds of singers from across the country in workshops, performances, and sisterhood. No auditions are required for the open house! If you like what you hear and are interested in joining for the semester, you will set up an audition with our very friendly director Heidi. 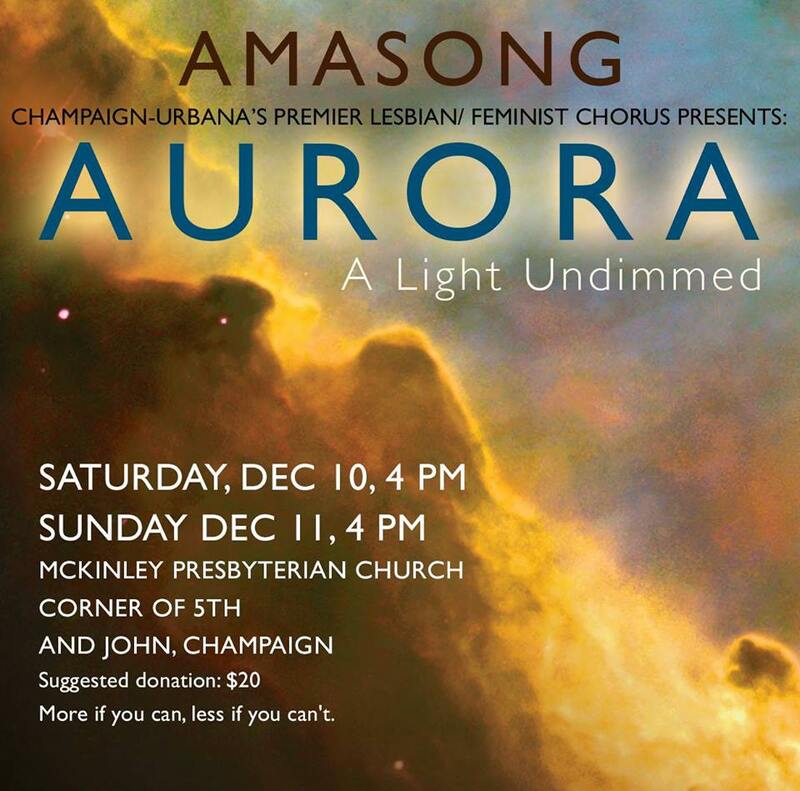 Join us at McKinley Presbyterian Church sanctuary (corner of 5th and John in Champaign). Exact time TBA but probably 6:45–9:00 or so. Email office@amasong.org for more information and stay tuned on our Facebook page. Everyone is welcome to enjoy soaring songs with us. 4pm Saturday and Sunday December 9 and 10. $10-20 suggested donation. More if you can, less if you can’t. On August 31, our regular evening rehearsal will be an open house for all self-identified women who sing in the treble range who want to know more about what Amasong is all about! No auditions are required for this event! If you like what you hear and are interested in joining for the semester, you will audition with our very friendly director Jill. 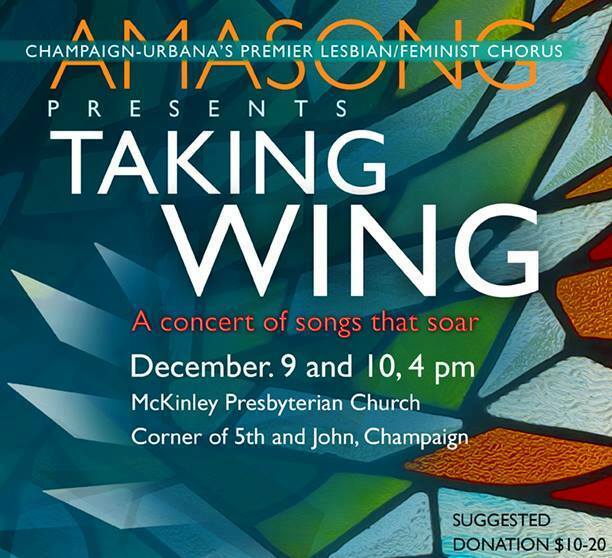 Join us at McKinley Presbyterian Church sanctuary (corner of 5th and John in Champaign). Exact time TBA but probably 6:45–9:00 or so. Email office@amasong.org for more information. 4pm Saturday and Sunday April 29-30. $20 suggested donation; more if you can, less if you can’t. McKinley Presbyterian Church, 809 S. 5th Street, Champaign (corner of 5th and John). Register for Joan Szymko Residency October 22! Amasong and University of Illinois Women’s Glee are so excited you are interested in joining us for the Joan Szymko Residency on October 22, 2016. Individuals are invited to sing with the mass chorus, attend workshops and Q & A sessions during the day, and watch Joan Szymko work with choruses. Workshops scheduled for Saturday will run concurrently with chorus rehearsals. Workshops will be open to interested participants and may include- Alexander Technique (M. Johnson), Healthy Belting (S. Johnson), Care and Feeding of a Healthy Voice (Y. Gonzalez-Redman), and Dalcroze movement. Mass chorus rehearsals begin at 3PM and the performance is at 7:30 in the Great Hall of the Krannert Performing Arts Center. Individual registration is $15 and includes admission to the concert.